Two-phase cleansers which need to be shaken to blend the parts are a revelation and the only formulation which effectively removes even waterproof mascara without too much scrubbing. The latest one I've tried is Bourjois Express Eye Make Up Remover for £4.99 at Boots. You get a massive 200mls which will last you at least 2-3 months of everyday use. While I do like it, and have seen others compare it to Chanel's offering (made by the same company after all), I do feel it's not as effective as my beloved No7. You really need to drench the cotton wool pad to avoid having to rub the eye area a lot. However it is described as 'non oily' which the No7 definitely is. I don't mind a bit of oiliness if I'm only going to bed right after, but if you need to remove make up with the intention of reapplying right away, you may prefer this Bourjois one. Although you get a lot for your money with this one, as long as the No7 £5-off vouchers keep coming, I'll be sticking with old faithful. I've lost count of the number of bottles of this No7 Cleanse & Care Eye Make Up Remover I've gone through, but it's definitely double figures. Although you only get 100mls for £7.75, you need less of the product that the Bourjois one, so it lasts about 1 - 2 months, and if you have the aforementioned quids off voucher you get it for only £2.75. I always stock up and have never paid full price for it. I can't say enough good things about this product - it is firmly one of my holy grails. It demolishes waterproof mascara and Illamasqua's stubborn Precision Ink no problem. If my make up is very heavy I soak a cotton pad and hold it over my eyes, gently pressing for about 5-10 seconds, then wiggly a bit and repeat until my eyes are clean. I always find a small residue beneath my eyes in the morning so I just take another cotton pad, dot a little bit of remover onto it and wipe off. I buy Botanics Soothing Eye Make Up Remover whenever I'm out of No7 and I'm waiting for the next voucher round and it does a pretty decent job, but it's not as oily or nourishing. It's £3.05 for 150mls from Boots, which is fabulous value, but I think the packaging really lets it down. It's so fiddly to remove the cap (remembering of course to shake it first) and I always spill out more than I need, leading to wastage. For this reason I always hang onto an empty No7 container and dispense the Botanics one into it for ease of use. While I've never bought a full size of this one, I've had many a travel-size sample which convinced me about the fabulousness of the two-phasers. For £20 it of course works fantastically, tackling waterproof mascara without a blink (see what I did there?!) but I honestly can't detect much of a difference between this and the No7 one - they're the exact same shade of blue even! The only reason you'd pay almost 10 times more is to have a nice bottle and brand name in your bathroom, and of course, this is a good enough reason for many! All in all, I urge you to try the No7 eye make up remover if you haven't already! What's your favourite eye make up remover? Have I missed any vital ones? I love my Lancome bifacil but I am nearing the end and I am broke, but Im a tiny bit scared of No7 as the skincare range has never suited my skin.. 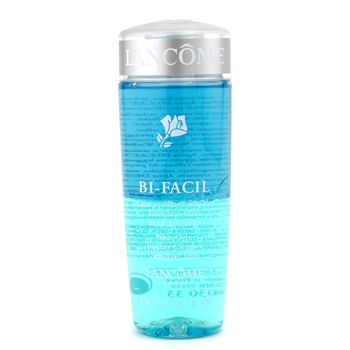 I am in love with Lancome's bifacil but cannot afford it so have now swapped to L'Oreal Dermo-Expertise which i am LOVING and Superdrug do 2 for £5/6 - BARGAIN! The No7 one is definitly one of my holy grails and very similar to the lancome one. I've currently got 3 stocked up from the last vouchers. I try to make sure I never run out and never pay full price! My favorite is Maybelline lip and eye makeup remover because it easily removes my waterproof mascara and it is very inexpensive! I've been using the Botanics one... I kind of like the bottle visually, but it's so fiddly!